Everything you needed to know about SCA garbing, you learned in kindergarten. At Storvik Novice and at Pennsic I taught a pretty well received class about the basics of garbing. 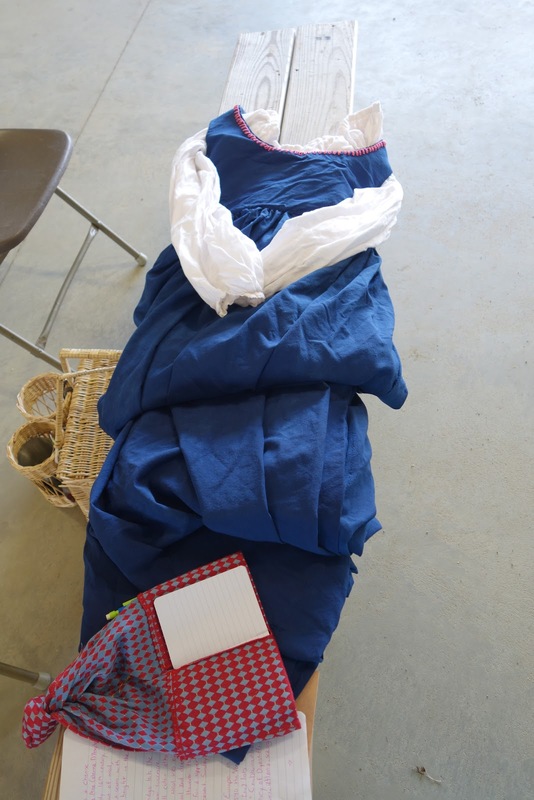 It's just a general overview explaining away some very common myths regarding the types of fabric and colors that were available during the SCA period. Really, although I called it Garbing 101, it's more a "You learned this in kindergarten!" type class. o Daily Life in the Middle Ages By Paul B. Newman – Linen is grown pretty much everywhere in Europe. It’s used in almost everything in the middle ages as well. Think of linen as we think of cotton today – it makes everything. o Norse Clothing Patterns: Reconstructions of Viking Garments from Greenland Hardcover – 31 Dec 2009 by Else Ostergard (Author), Anna Norgard (Author), Lilli Fransen - The extant Norse clothing is fascinating due to its preservation but also most of the garments are made of wool from sheep shepherded by those living in Greenland. o Mostly upper class but not exclusively. Even most of the lower classes could afford a bit of silk trim – particularly from an older garment. o Mythbuster: Not as rare as many people are lead to believe! There is already an excellent article at http://costumedabbler.ca/cotton on how period cotton is and who had access to it. The above is a handy dandy quick chart to the fabrics of the middle ages. Linen really was used in EVERYTHING. Not only were hats and underwear made of linen, but so were linings to garments and even garments themselves. We still have linen prints from pretty much every era and rather intricate designs. If they printed it, you can bet they wore it out. In fact, in one of the 16th Century Modas one of the Italian City State peasant dresses is said to be made in Linen if they must - meaning linen wasn't a choice material but it was done to make outfits. I say this because there is a myth stating that linen wasn't really used for clothing other than undies and we use it in the SCA out of necessity. We do have some tailor's records that suggest that linen was used by the upper class as well. There is one record from about 1405, I believe, that describes a linen gown...but it's one out of many, many gowns being described and the only linen gown on the record. So it wasn't a fabric of choice but it was a fabric that could be used. In other words, it was the cotton knit of the middle ages and, just like we use cotton knit today...you really wouldn't wear your t-shirt to a ball or any formal event. Wool. I LOVE using wool. The myth with wool is that it's warm and thick and unusable in the warmer climates. This is so blatantly false, it's not even funny. One of my favorite gowns now, shown poorly below, is made of wool I dyed in indigo. I had it on display at Pennsic 45 (2016) and people would stare at me in shock when I told them it was wool. They'd finger it, trying to figure out if it could be anything else because it's super thin. Tropical weight wool is like that. Even those that know about tropical weight wool believe it's too hard to find...which isn't true. Most suiting weight is light enough to use for SCA purposes. The problem really is that it comes in boring colors. However, you can dye absolutely anything black and we'll get to colors in the next post. The Greenland digs, mentioned in the chart above are an AMAZING resource. No matter what time period you might be interested in the digs of the 13th/14th C garments really help to understand garment construction overall for most of the middle ages. Most of the garments (maybe all?) are made of wool. Of course, most people will argue it's Greenland so, of course they need wool! It's cold! However, there are garments of Italian Saints that are extant and made of wool. It might get cold here in Italy in the winter but it's anything but in the summer. There are also more than enough records showing wool was used throughout Europe and pretty much was the cotton twill of it's day. Silk is an easy one because there aren't any myths about it to my knowledge. Everyone had access to silk. The Norse had silk. The Turks had silk. The Italians had silkworms. Of course, it was expensive so a peasant might have a bit of silk trim on their best garment and nothing else of silk but it was available to everyone. Cotton is the funny one. The myth is that cotton was too expensive in period which is....just not true. It comes from a rumor that Queen Elizabeth I of England stated that a cotton chemise, given to her by a prospective marriage partner in Spain, was simply too dear (expensive) and she dared not wear it. Now, if this is true, you have to understand some of the underlying politics and relations of the time. Depending on who sent it to her, it could have been her former brother in law or it could have been one of his kids. Either way, a former brother in law or one of his kids sending you what is essentially lingerie? CREEPY!! So, Queen Elizabeth has a choice. She can embrace the creepiness which ummm...no. She can laugh in their face and tell her former brother in law or his kid that they are total perv...which would start a war with Spain so...no. Or, she can simply say thank you politely, say it's very thoughtful, and have it taken to some back room where it will never see the light of day again. She took option three. Another problem with this myth - it only deals with England! Clearly, if Spain gave the chemise to Elizabeth, cotton was a thing in Spain. The link in the table above, http://costumedabbler.ca/cotton, really is an excellent article that goes well into the cotton issue. I highly suggest it. Yes, modern cotton is different because of our modern (cotton gin!) manufacturing processes but you can find some cotton that looks rather period correct. Personally, if the cut is correct, I'm not concerned about if it's the "correct" type of cotton or not. EDIT: Eva has also written an article on cotton in the middle ages - mostly focused on the domestic European production of it. With that, I wish you all a Happy New Year! The next post will start my posts on colors in the SCA period and the various myths associated with them. Sorry for the sideway photo! I took it with my phone. Anyway, I baked a ham on Saturday. Ham is ridiculously cheap at the Commissary (a little over $7 for a 4lb ham!) right now. 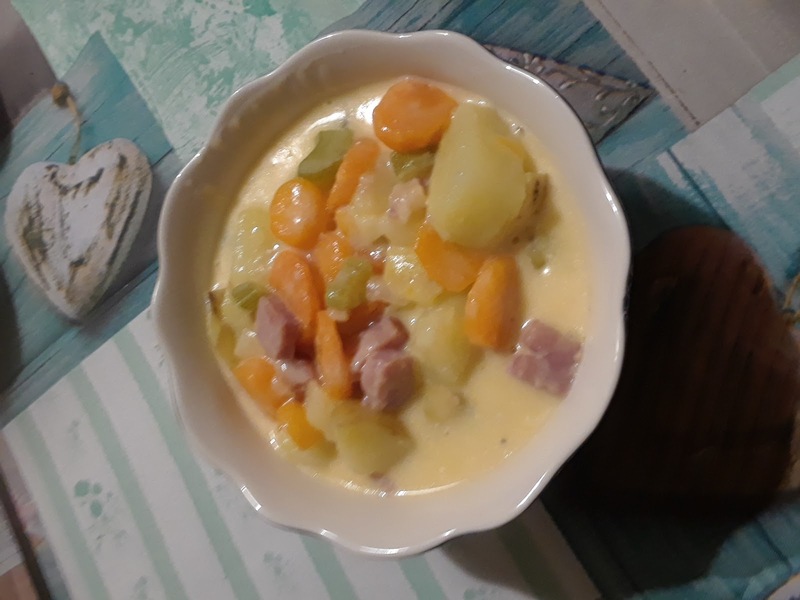 Since I've discovered I like cooking one big meal a week and then using that to make "leftover" meals, getting ham and thinking of all the wonderful dishes like fried ham or ham and potato soup sounded like a very good idea. However, I needed a recipe for ham and potato soup since I hadn't made it before. I found this one on pinterest and, oh my goodness, it's creamy deliciousness! I didn't modify it much (I added salt and didn't add the red pepper; also used about half the amount of cheese, pre shredded) because I was curious how it would turn out. It's basically taking a bunch of leftovers and throwing them into a pot. It's super simple to make and who doesn't like a big bowl of soup or stew in winter?